OK - great. It's subject to disagreement I just hear of people leaving the pump on for endless hours. Full vacuum should be in a few minutes if a faster one or more. Hold that is what counts is proof if you believe your gauges. Could have said do it with a warm engine is a tad better. There are charts or I'll find them here someplace. Full vacuum at sea level is 29.92 Hg. That's inches of mercury. Most gauges will just peg at 30 for me altitude counts so know that. I'm at 232 ft. above sea level doesn't show up so little. For each 1,000 ft. you can deduct 1 Hg. is full vacuum all that unless equipment is compensating or some display. Major pest for me to quick use some other type of something, even a brand gauges or pumps just where they are locking in or out pressure or vacuum. Thanks for the help. It didn't work but it reminded me how much I enjoy learning new things. I replaced the dryer and the expansion valve since it seemed reasonable at the time (system was empty). The expansion valve was brutal and I am 5' 9". I don't even want to think how tough it would be for a larger person. I replaced a couple of leaking 0-rings and a Schrader valve that broke under vacuum. It held vacuum. But by the time I had it back together enough to charge it was Saturday and my pro was home enjoying life, at least I hope so. Eager to flush money down the drain, I bought an 18 oz. can of 134a and a tap. I used the procedures in the link provided in this thread and charged it. I think it may need a compressor but this is where DIY ends for me. I'm not a 'nobody's looking, vent to the atmosphere' kind of guy so I'm headed to my pro tomorrow. The high side doesn't get very high and the low side seems way low. At some point in the process I see the gauges start to move but the compressor slows to a halt and the belt slips. The belt IS properly tensioned. If anyone is bored and enjoys teaching a fool I'd be glad to post a video. As I said, it's going to a pro. But I wouldn't mind learning more. My guy is really busy sometimes and he may have me replace the culprit. I provide him both income and entertainment. Before you give up, replace the belt with the one called for. I have seen 7/16" (11mm) belts used on 1/2" pulleys and they will bottom out and slip regardless of tension. If it is a one serpentine belt, when was the last time it was changed? Until the compressor is turning all pressure readings are moot..
What the heck, a new belt isn't going to break me. I'll do it. This belt drives nothing other than the compressor and it has about 18,000 miles on it since we rebuilt the engine. The compressor IS turning. I can see the clutch engage, the compressor turns, and very cold air comes into the cabin. Then something happens, the compressor slows, then stops, and the belt squeals. Then the compressor starts turning again and the process repeats. I have the factory service manual in front of me. It says that at 86-95 degrees F the low should range from 18-21 psi and the high from 213-242 psi. It was only 70-71 degrees when I shot the video but to me it's screaming that something is not right. I never put much stock in "should be" pressures charts. The high side pressure of a properly charge system show the condensing temp of the refrigerant. the low side shows the evaporating temp. Condensing temp will never equal ambient temp of air passing thru the condenser, but the closer you can get it the better the system will work. 134a will condense at 144 deg (242 psi) so that is roughly 50 deg over the ambient of the 95 deg stated. That's fairly poor heat rejection from the condenser. I am much more interested in what IS happening and why. If the system isn't getting the heat out, that needs to be solved. The pressure vs, temp charts for both R 12 and R134a are posted in the reference and resource section of this site. Put another way, gauge readings show you what is happening in the system, charts show what you might expect under some condition the chart maker used, the 1st is of much more use than the 2nd. Late to catch up some with this. True, pressures are not or no longer part of 100% of what you'll aim for I do recall such thing but that was for OMG 1960s 6 lb systems and wasn't good then either. Every system had a sight glass you saw what was there. That video is all lousy IMO it's also a tad cold if you could get to a real 80F and do raise the idle speed about 1,500 it's more accurate to me anyway. Worried about that squeal? Is that belt or compressor itself making noise? !! Those about can't be producing cool air IMO if accurate and might not be? High side pressure while operating if all is normal and as intended would be about 2.5X the air temp coming thru the grille. Forget the thermo hanging on a tree nearby it's what the car gets right where it is. That if no other info just looks seriously undercharged and if so don't run it as it's too low IMO to circulate oil let's avoid that. 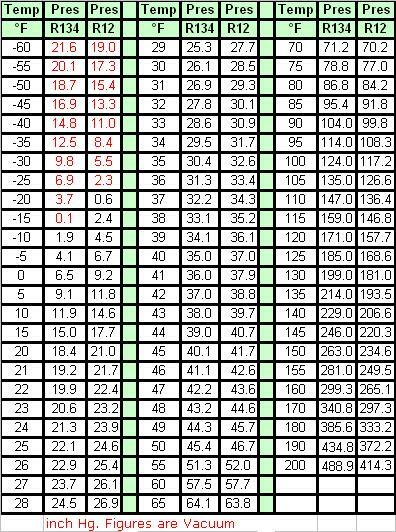 For now the chart mentioned is the temp/pressure one Cornbinder mentioned will post it again it can be removed if just taking up room. That is real TMK. Infrared temp readings of just a line or can of known refrigerant that is the pressure inside it! Tom - The squeal was when the compressor would stop turning and the belt would start slipping. Well, this is not my proudest moment. I'll say this, the belt for the A/C is buried behind the serpentine belt and it sure looked fine to me. But when I got it off it was a bit glazed down in the grooves. It still looks serviceable to me but I changed with a 'made in USA' belt. Now with the new belt the compressor keeps turning. So either the belt actually was bad, or maybe I got some liquid into the system last night, or I just don't know. The compressor is no longer stopping. Thanks, Cornbinder. The pressures still seem a little low, right? If that can didn't have 18 oz. in it (should have weighed it) or if holding it with your hands around the bottom until it reaches room temperature doesn't mean you got it all, then maybe it is undercharged. I am pretty sure my pro will start with recovering what's in there now and refilling it until he's put in just enough. It might be money well spent at this point. Don't get me wrong, if there's something else I can try I probably will! I can undo the wiring connector on the compressor and drive the car with no danger of running the compressor more, can't I? If the system calls for 18 oz, and you put in somewhere around that much, I wouldn't worry. it can be hard to interpret what the gauges are telling you without a good heat load on the system. From post #22. Compressor stops turning when squeal is present or was. Still either belt just not snug enough or compressor had serious resistance to turn either choking or internal friction. Noted: 18oz can for an 18oz system. Is that the push button one with hose already attached? I just question the connection itself I think those are meant for one time use actually delivered "close enough" to the amount of refrigerant? It shouldn't be able to deliver too much. At least now you have a tare weight of that can just for info. What to do now? Can you turn compressor by hand or tool to get at center of it's hub? Try that. If not smooth turning with even resistance this could be in trouble. I'd probably vacuum and charge it again see what you get then. Too late now sorry about that. When a system is under full vacuum and using the small cans or single 18oz one I have one of those untouched still, either way should be able to get quite a bit in system if can is warm, car/system is cold without engine or compressor running at all you'd hear it hissing away with a poor connection if that happened. For the moment stuck with any more ideas. If in front of me would be checking the Acme low fitting on car and the one on that can I think? The new belt cured the squeal/lockup. Not my proudest moment. I was sure it was fine. The can was one that let me screw the yellow hose from my gauges onto it. I bought it at a really friendly place and I'm pretty sure they would let me weigh a full one for a sanity check. Yes, the compressor turns easily by hand. I was just refusing to believe that the belt was bad. Changing it changed everything. I know I posted 2 pictures but now I don't see them. Not sure what happened. Today, as luck would have it, the temperature is only supposed to get to 55. Tomorrow it should be 75 and sunny. I'm thinking that it might be interesting to leave the car in the sun for a few hours to warm up and have another look with the gauges. Even if I take it to my pro, he will prefer a warmer day, right? You'll never get the full amount from a can into your system. Never use any sealer or refrigerant with sealer. Some UV dye is fine. Picture posting did show just a black "X" that you tried just didn't show. I plead IDK I/we didn't block them. Sounds LOTS better now that you explained. Hey - I struggle with cold weather or just days or the larger 30lb bottles cold just don't behave. Belts! OMG another hurdle. You said you chose an American Made one. It is a better bet or the dealer if known an OE belt. Have had them fail, screech, crackle in seconds from new another last ages. Oh help us all with quality in the mix. Not really a trick but almost all A/C will at least try to run and does when you request DEFOG/DEFROST settings. The two reasons I know of are to reduce moisture of that air the heater core wins 10 to 1 over A/C so puts out drier air within limits. It also exercises compressors in off season to keep lube moving and does just parked from engine heat most can click on when very cold then quit. Most require a minimum "static" pressure and engine heat does that. Even at 55F if it does click on and not hurt yourself just feel the lines close to compressor will be noticeably warmer and cooler. That's a good sign it's at least close and you won! Speak for myself the whole idea to keep this site alive is help for success and or warn of the costly downside of failure is super common the products sold suggest it's so easy any village idiot can do their own. It's just not true you do need to understand more those products don't care just anything to sell stuff. I guess now the real test is it needing to work for real. Quiet operation and center vent temps should be able to do mid even low 40s (F) @ 80F ambient and higher temps outside to a point you'd expect is just excessive well over 100F you forgive things. For Cusser: Glad you're watching and chiming in! I've seen that 18oz can says if real it's pure 134a no junk in it. Just maybe the days of the "Death Kits" are catching up and folks more aware? Was at Walmart of all places pure product goes give-a-way prices in Fall here! You give me too much credit. I chose what I could buy on a Sunday! My son drove the car to school so I have a day off from it. Some question now looking back that you didn't get it all out of the can? I'm not there but we (I think) mentioned have the can warmer than the car's low side as it charges goes cold and when it re-warms up FAST it's essentially empty. If any doubt keep everything till totally calling it done. Weight it. Now see if more can come out or shake it you'd feel some slosh. Still if it worked and is pure as I think it might be AND one time use likely punch a hole in it (use all caution now if more in it you can freeze burn yourself) and really know. Knowing tare weights is just nice. Write it down on same brank stuff you'd buy again so you know. Hey, if I catch a steal buy a whole case weight them all sometimes find one empty. This is MA top few places for cost of room to store stuff off season cheaper to almost give it away the longer hours of stores on a Sunday especially wouldn't keep much or any off season stuff unless I'm wrong it goes out of state. The space to store things it heavily taxed get it out of here but that costs inventorying it and restocking later, shipping costs back and forth it's cheaper to sell of even below cost for some stuff get room for stuff that sells. You've quickly at least been given a lot of info in just this thread is a good start there will always be more to know and tools to acquire. That alone is not cost effective if you go nuts and don't plan on more use of it. Still can wait even later today when car get back you can do the touch, feel trick if still really to cold out use the defrost thing and watch. If all wrong disable it and go back later. Be glad in some ways this layout uses a separate belt? Why? A failed system that locks up a one belt set up you lose the use of the vehicle till dealt with, wreck that belt or worse it busts and damages other things. So back to let's see when a real just performace test already said when system is working hard for real can call it done.